You have three options to increase bone mineral density and decrease the probability of broken bones as you age: strength train, take medications, or do nothing and hope you don’t fall. Wendy chose the first option. A year ago, at the age of 65 Wendy was informed, “There is osteoporosis in the total lumbar spine, total hip, and femoral neck. There is a 10 year probability of major osteoporotic fracture of 20%”. Wendy has been strength training with us for the last year. The sessions are thirty minutes, once per week. The only other change to her regime was taking calcium supplements. While strength training is not a cure for decreasing bone density, it is an effective treatment. A treatment can slow, reverse, or stop the progression of a condition. Another 60 year old client of ours increased her bone density one standard deviation over the course of two years – one 30 minute workout a week and no meds. Significant results do not require hours in the gym. Those who are older required more recovery, and for most, strength training one time a week is optimal. At our Austin Personal Trainers facility we work with people of all ages. Using MedX equipment with special medical rehab features, we can accommodate those with limiting conditions. All totaled, Wendy strength trained for about 25 hours in the past year. Had she not exercised her condition would be likely worse, possibly much worse were she to fall. Was it worth the 25 hour investment? Wendy will tell you that it is. Carol’s osteopenia was progressing, and she lived in pain every day due to her scoliosis. Past attempts at exercise resulted in more pain. She began exercising with us, her pain disappeared, and her muscles and bones became stronger. At Austin TX Personal Trainers and at New Orleans Personal Trainers we primarily use MedX rehabilitation exercise equipment and a protocol that is gentler on the joints. Carol demonstrates and comments on her exercise results in this video. Her words: “Replaced, repaired, restored”. A study followed 750 women aged 50-94 years for a decade. Researchers wanted to see the effect of changes in bone mineral density (BMD) and appendicular lean mass (ALM) on mortality. The study found that deaths increased as BMD and ALM diminished irrespective of age. Another study had a similar result. The takeaway: Lift weights like your life depends on it. At Austin Personal Training and New Orleans Fitness Trainers we have had success with clients who have increased their bone density and lean muscle mass. There is a catch: how to stress the musculoskelatal system sufficiently to stimulate improvements in muscle mass and bone density, and at the same time, avoid injuries. We use MedX equipment. The equipment has special medical-rehab features that make exercise easier on the joints. It allows us the work the body sufficiently to stimulate improvments while sparing the joints. “Poor musculoskeletal health increased the risk for mortality independent of age. This appears to be driven mainly by a decline in bone mass. Low lean mass independently exacerbated mortality risk, and this appeared to operate through poor health exposures.” The takeaway: Stay as strong as you can as long as you can. Proper strength training will add to your lean muscle mass, even those who are considerably older, and it can forestall the progression of osteopenia. While strength training is not a cure for decreasing bone density, it is an effective treatment. A treatment can slow, reverse, or stop the progression of a condition. A 60 year old client of ours increased her bone density one standard deviation over the course of two years – one 30 minute workout a week and no meds. Significant results do not require hours in the gym. Those who are older required more recovery, and for most, strength training one time a week is optimal. At Austin Personal Trainers and New Orleans Personal Trainers we work with people of all ages. We use MedX equipment; with its special medical rehab features, we can accommodate those with limiting conditions. Birds, hollow bones, osteopenia, and trabecula! Birds can fly because their bones are hollow. That's what I was always told growing up. Turns out your bones are hollow too, but you can't fly. Bones are hollow to keep them light. To make them strong they have an internal structure comprised of tiny struts called trabecula. As bone density decreases the struts get thinner and weaker. Doctors call this osteopenia. This is still reversible. When enough of the struts erode completely away it is called osteoporosis. You ability to repair this damage is greatly reduced. Strength training can increase bone density, can stop the progression of osteoporosis, and it can reverse osteopenia - two notable cases where clients of New Orleans Personal Trainers and Austin TX Personal Trainers reversed their osteopenia. Oh yeah, so if it's not the hollow bones how come birds can fly? Don't quote me, but I think it's cause of the wings! Thank you to John Shafer, personal trainer at Kelly Personal Training Austin, for writing this blog post. The researchers wanted to see if lumbar extension could reverse thevertebral osteoporosis that results from the post-transplant drug regimen. The control group did nothing, and the trained group did lumbar extension exercises. Six months later the control group was worse off, and the trained group returned to with 5% of their pre-transplantation baseline. At Austin Personal Training and New Orleans Personal Training we have been seeing results like that for years. It helps to have capable trainers, the best lumbar extension exercise machine on the market, and the protocol to use it. The exercise protocol we use was derived from a study working with osteopenia sufferers at the University of Florida. Researchers found that joints hurt less, bone density increased, and muscles were stronger and more toned with minimal time exercising. It has been shown effective for men and women of all ages. Debra increased her bone density almost one full standard deviation - at age 60 no less. Carol suffered from back pain that prevented her from doing weight bearing exercise. Carol was able to use our MedX equipment with its special medical rehab features. After more that 20 years since she was first diagnosed with osteopenia her doctor informed her that she was osteopenia-free. As she put it her 'bone tisssue was replaced,repaired and restored". The exercise protocol used by the personal trainers at Austin Personal Training and at New Oreans Personal Training was derived from a study working with osteopenia sufferers at the University of Florida. Researchers found that joints hurt less, bone density increased, and muscles were stronger and more toned with minimal time exercising. It has been shown effective for men and women of all ages. Stronger muscles generating more force will require stronger connective tissue and bones to handle the additional stress on the system. Strength training is not just for strength. Proper strength training results in increased strength, bone density, body leanness, flexibility, cardiovascular ability, plus added protection from injury and a stronger immune system. More than anything else you will feel so much better. At New Orleans Personal Trainers and Austin Personal Trainers our strength training program is designed to be efficient and effective in getting those benefits listed above and to increase your quality of life. Recently one of our clients brought in a cookie cake in gratitude for John Shafer, one of our trainers, and a card shown here that says it all. It is results like these that really make our work rewarding. Debra was more than two standard deviations of away from the ideal bone density of a 25 year old. In the time she began training her bone density went from being more than two standard deviations away from ideal to slightly more than one standard deviation away from ideal. While she still slightly in osteopenia, she is going against the trend of decreasing bone density that is common for people her age. Debra will be 60 soon. Her regimen: she takes calcium supplements and vitamin D3, strength trains one a week for 30 minutes, and walks daily. She has lost 20 pounds. Our bones adapt to physical stress and are constantly remodeling themselves. If you expose the body and the bones to weight-bearing exercise the body and bones will adapt and become stronger. A little strength training, an active lifestyle, and better eating choices can have profound effects on one's fitness and health. These changes do not require endless hours in the weight room. Our fitness trainers at New Orleans Personal Trainers and at Austin TX Personal Training can guide you through an effective strength training program that will take less than an hour a week and achieve life-changing results. A cure relieves a person of the symptoms of a sickness or a condition. A treatment can slow, stop, or reverse the progression of an illness or condition such as osteopenia. Some of our clients have had amazing results in reversing their bone loss. There is no cure for osteopenia or osteoporosis. Treatments for osteopenia include changes in diet, supplements such as calcium and vitamin D, hormone therapy, several types of osteoporosis drugs, alternative medicine, and physical activities and exercise (particularly weight-bearing exercise). Of course, there are side-effects to taking the osteoporosis drugs, none of them pleasant. Our body is constantly adapting to the physical stress and strain. 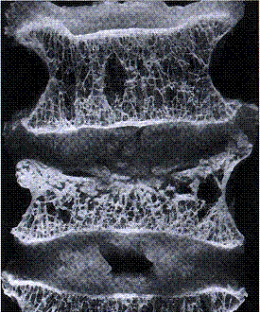 Our bones adapt to physical stress and strain and are constantly remodeling themselves. If you expose the body and the bones to weight-bearing exercise the body and bones will adapt and become stronger. If one has osteopenia one could see a reversal or experience a cessation of the bone loss. In the case of osteoporosis you are less likely see a slowing-down of the bone loss or a reversal. Osteopenia progresses to osteoporosis. It would seem to me to be crucial to stop this bone loss process early on rather than wait until the process is well on its way to osteoporosis when a reversal is less likely. With a stronger body one is less like to be injured and suffer factures. When fractures occur exercise might then become out of the question. If you keep putting the decision to exercise off it might be too late. More articles on bone density here. Carole was diagnosed with osteopenia at age 43. Her most recent bone scan, 22 years later showed no osteopenia. It is the nature of osteopenia to progress to osteoporosis; Carole certainly does not fit the mold. While there is no cure for osteopenia, strength training has been demonstrated to be an effective treatment. Treatments can slow, or temporarily stop or reverse symptoms – in Carole’s case dramatically so. Carole is a client who has been working out at our Austin facility for five years. Carole has significant scoliosis, and her past attempts to do weight bearing exercise invariably resulted in injury to her back. When she started our program she was living with daily back pain. She was able to do our program without further injury and her back pain soon disappeared. We use primarily MedX rehabilitation exercise equipment and an protocol that is gentler on the joints. A little strength training, an active lifestyle, and better eating choices can have profound effects on one's fitness and health. These changes do not require endless hours in the weight room. Our fitness trainers at Austin TX Personal Training and at New Orleans Personal Trainers can guide you through an effective strength training program that will take less than an hour a week and achieve significant results. 1. This affects all aspects of my life. 6. After each session, I always felt better on all levels. The subjects exercised twice a week performing five different exercises. They ranged in age from 50 to 70. High intensity strength is usually performed once or twice a week to see continuing results. A session usually lasts about 30 minutes. We have such a strength training program at both our locations - New Orleans Fitness Trainers and Austin Fitness Training. An active lifestyle, better eating choices, and a little strength training can have profound effects on one's health and fitness, and it is a program most people can stick to. Many years ago I attended a conference hosted by Arthur Jones, the inventor and owner of Nautilus exercise equipment. He put forth the idea that older women with osteoporosis broke their hips before they hit the ground. He said that their bones were so porous that their hip bones gave way first and then they fell. In the confusion they were not sure when their hip broke and assumed it had broken from the impact of hitting the ground. Sure some broke their hips from the result of the impact, but he surmised that some had broken their hips first and then fell. Arthur commissioned a study at the University of Florida to see if strength training would result in an increase in bone density for elderly women. Using the standard protocol of lifting the weight in one or two seconds resulted in too many injuries to the participants. They began using slower movements to minimize the potentially harmful acceleration forces that occur at the beginning of each repetition of exercise. The slower movements resulted in much less momentum and more effective loading of the muscle with the resistance necessary to induce increases in strength. The women got stronger and persistent injuries stopped. Some who had entered the program and had requiring a walker no longer needed a one. Their bone density increased. You need not spend hours in the gym to make a profound difference. Studies have shown that significant strength increases result from high intensity interval training as little as once a week. Number ten in a series about what clients have to say about their workouts. I have had two women (aged 51 and 56) with osteopenia start strength training on the recommendation of their doctors. Both were told to strength train for six months and then have their bone density retested to see if there was an improvement. In both instances their bone density increased, and their doctors told them it would not be necessary to start a drug treatment. A treatment, while not a cure, can have varying degrees of success. A treatment can slow the deterioration process, prevent the condition from getting worse, or it can reverse that deterioration process. With both these women they were able to reverse their bone losses. Hopefully that continues far into the future, but there are no guarantees. There is presently no cure for osteopenia. There are two treatments often mentioned – exercise and osteoporosis drugs. When comparing the side-effects of the two treatments exercise is clearly a much better choice. The exercise protocol used by the personal trainers at Austin Personal Training and New Orleans Fitness Trainers was derived from a study working with osteoporosis patients. Researchers found that joints hurt less, bone density increased and muscles were stronger and more toned with minimal time exercising. It has been shown effective for men and women of all ages. 3. After each session, I always felt better on all levels. 5. This affects all aspects of my life. 1. Are bone loss drugs a good idea for those with osteopenia? Are bone loss drugs a good idea for those with osteopenia? “It was a W.H.O. panel financed by the pharmaceutical industry that in 1994 defined normal bone mass as that of an average 30-year-old woman. Because bone naturally deteriorates with age, anyone much older than 30 is likely to qualify for a diagnosis of osteopenia; using similar logic, a middle-aged woman might be said to have a skin disorder because she had more wrinkles than her 30-year-old daughter. Please explore other topics from our blog by clicking the tags below.